Cook , Joseph , Jane Kabubo-Mariara and Peter Kimuyu. 2018. “Happy Collecting Water? 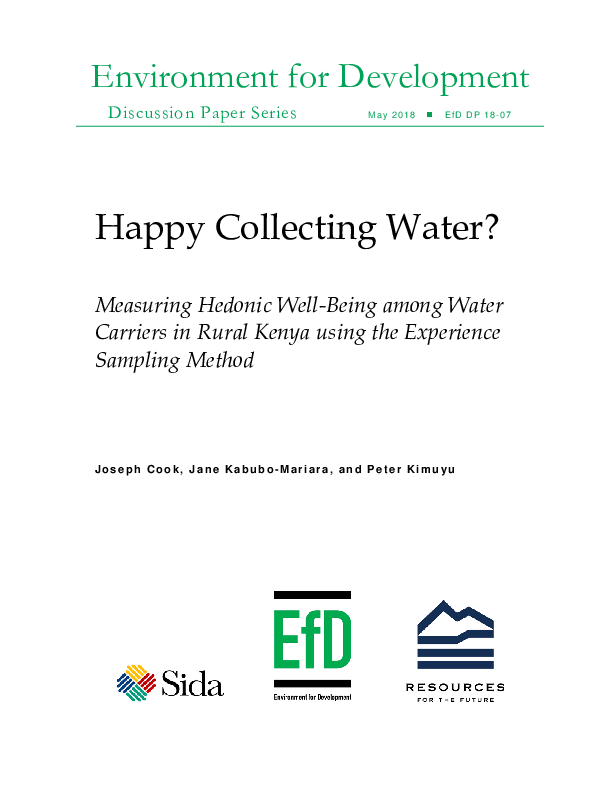 Measuring Hedonic Well-Being among Water Carriers in Rural Kenya using the Experience Sampling Method.” EfD Discussion Paper Series 18-07. Despite work’s importance in most people’s overall sense of purpose in life, several studies measuring momentary well-being find that people are quite unhappy while at work. The study populations and the nature of work in these studies, however, are all similar: industrialized workers doing paid labor in the formal sector. What about the large fraction of humanity for whom “work” is primarily working on smallholder farms, tending cattle or collecting water or firewood? We use the Experience Sampling Method (ESM) on a sample of 220 water collectors in rural Meru County, Kenya, the first such application in this type of setting. We asked respondents to complete a short survey multiple times per day over eight weeks, asking about their primary activities and affect (happiness, sociability, energy and safety) at that moment. Results from a person-fixed-effects model of 12,939 ESM records show that respondents are indeed less happy “at work”, whether that work is paid or unpaid casual labor (6 and 4 pts less happy on a 0-100 scale) or paid formal sector employment (10 pts less), or collecting water or firewood. Two results are somewhat tenuous but intriguing: the self-employed are actually happier while at work, and people are less happy when they report that their primary activity is “having nothing to do”. We also find a statistically significant, though small, relationship between the intercepts in the model (individual-level average well-being) and the log of household income. The relationship is stronger with wages earned by the water collector herself.